Last night, as a cross-party group of over 55 MPs wrote to the Metropolitan Police raising concerns about far-right protestors’ “intimidatory and potentially criminal” acts against politicians and journalists outside parliament, people switched on their TVs to watch James Graham’s new drama – Brexit: The Uncivil War. That intrastate war is, of course, still being waged, and it remains unclear who will be the victor. 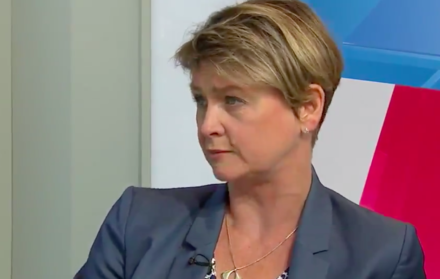 Yvette Cooper hopes it won’t be the hard Brexiteers wanting to leave the EU without a deal. The backbench Labour MP has laid down a cross-party amendment to the Finance Bill that would see the government’s tax powers curtailed in the event of no-deal, unless parliament specifically voted for that outcome (not going to happen). To avoid the restrictions, a deal would have to be approved (not looking likely) or Article 50 extended (increasingly plausible, whatever the government says). Cooper explains in The Guardian: “The amendment doesn’t affect the normal operations of the Treasury and government. But it does make it harder for the government to drift into no deal without parliament being able to direct it.” Around a dozen Tories (probably on this list) are rumoured to be supporting the move, which could be enough to get it through this afternoon. Richard Corbett writes for LabourList today about Labour’s own position and what he sees as the only options left on the battlefield. The European Parliamentary Labour Party leader, who publicly supports a fresh referendum unlike Cooper, rejects the idea of a different deal and sees stopping Brexit as the only possible path left for the party. He points to the YouGov poll widely promoted by pro-EU activists last week, and argues that “there are more gains to be made from Remainers than from Leavers”. But the leadership isn’t convinced. It doesn’t believe Labour can stop Brexit and thinks it would be dangerous – electorally and in a long-term, destroying-the-social-fabric-of-our-society kind of way – to try. Tomorrow Labour’s International Policy Commission will meet and discuss Brexit. The body includes members of the shadow cabinet, national executive committee (NEC) and national policy forum (NPF), as well as affiliates, and its role is to develop foreign policy. Clashes are to be expected. In the run-up to the meeting, pro-EU groups have been encouraging submissions in favour of another referendum and an emergency party conference. Plus, Another Europe is Possible says hundreds of local parties are set to debate its left-wing anti-Brexit motion by the end of the month. Yet Corbyn has been clear that he thinks Theresa May should return to Brussels and renegotiate once her deal is voted down next week. Labour’s own internal war over Brexit continues.